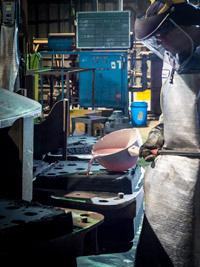 Our foundry’s melting department utilizes ten furnaces to melt metal. We have eight, 500lb, gas-fired, crucible furnaces for melting aluminum. From these furnaces, the molten metal is removed with a ladle and poured into the green sand or no-bake mold. We also have two induction furnaces for melting brass and bronze alloys. With these furnaces, the crucible is lifted by a hoist and the molten metal is poured directly into the green sand or no-bake mold. Longview Brass and Aluminum pays strict attention to industry safety standards in our melting department for the safety of our workers. Workers in this department exercise good safety practices by keeping a safe distance during the melting process and while pouring molten metal, use protective barriers where needed, and always wear the appropriate personal protective equipment when handling melted metal.